It’s that time again, London Fashion Week kicks off in T – 4 days, which means it’s time to get over excited and start planning outfits, right? Well actually no. As a relative LFW veteran approaching her 10th season of shows, I’m weary and looking for sleeping like a baby on Tuesday night already. Don’t get me wrong, I love British fashion and providing a platform for emerging designers but I’m already exhausted thinking about the whole brouhaha.I know there’s been a lot of debate about whether bloggers have a place at fashion week, especially in recent years. Call me biased but I see a lot of value in having an immediate, much needed media outlet for British designers. So as long as you take LFW seriously and are there to report on shows and provide a platform to support designers rather than faff around in the courtyard, I’m in full support. The challenge for the British Fashion Council, PR companies and brands is to separate the genuine bloggers from the, for want of a better word, bloggers. As part of the BFC Blogger Panel since September 2013, I’ve been part of the changes the BFC has been making. In a nutshell, the right bloggers are being accredited which means less are receiving accreditation but the BFC is being more transparent in what accreditation means and how both accredited and non-accredited bloggers can take part. Accredited bloggers will receive the same facilities as accredited press and buyers at London Fashion Week, including fast track access to the event, entry to the onsite press and buyers’ lounge, lockers, laptop and charging facilities, and use of the press and buyers’ shuttle buses. Accredited bloggers will also be invited to attend on-site events throughout the five days including a drinks reception within the Designer Showrooms celebrating the BFC initiatives Estethica, Headonism and Rock Vault; Fashion Film showcase and the LFW Designer Party. To increase awareness of accredited bloggers within the industry, the BFC will be publishing the blogger accreditation list for February 2014. This is circulated to all the designer PRs ahead of the shows as a guide to which blogs have been accredited and to help PRs when responding to ticket requests from bloggers. We have collaborated with Dazed Group to provide an additional opportunity for accredited bloggers. To coincide with the launch of their new online platform, Dazed will offer one accredited blogger the prize of a 6 month contract to join its new digital portfolio, OtherMode. The prize will position the winner’s blog alongside other best in class independent bloggers, publishers and Dazed Group’s own sites including HungerTV.com and AnOthermag.com. The selected blogger will be showcased as a guest contributor on DazedDigital.com. The LFW bloggers hub is online and available to both accredited and non-accredited bloggers, and will be updated daily throughout the week with latest news and exclusive image content. 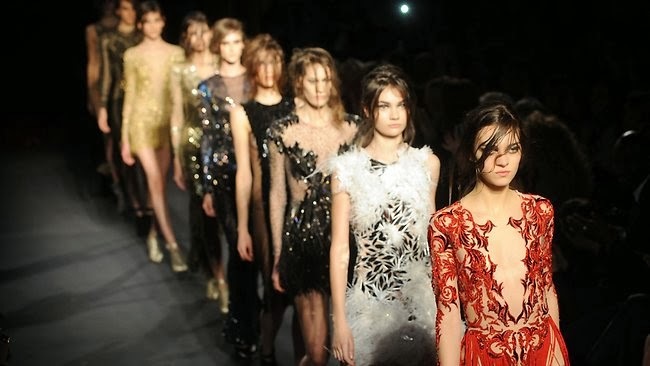 Our dedicated media portal will also be home to the official live and on demand video content from London Fashion Week. Bloggers are able to register for access to the media portal and can embed video highlights from each day as well as a live link to stream the shows on their blog. There are more ways than ever before for non-accredited bloggers to experience London Fashion Week. The Courtyard at Somerset House is open to the public, and all shows taking place in the BFC Courtyard Show Space will once again be screened on the outdoor LED screen on the side of the catwalk tent. The International Fashion Showcase returns for February 2014 and will see over 30 embassies and cultural institutions across London create fashion exhibitions to display their emerging fashion designers. The showcase is open to the public, giving them the chance to explore work by some of the most innovative young fashion designers from around the world.For the first time a central venue at 180 The Strand will house 14 showcases. This central space will be designed by architect Pernilla Ohrstedt Studio and will show the work of exciting emerging designers from countries including Argentina, Austria, China, Czech Republic, Estonia, Georgia, Hungary, Nigeria, Paraguay, The Philippines, Portugal, Slovakia, Switzerland and Vietnam.Other countries displaying the work of emerging designers in satellite exhibitions across the capital are Brazil, Jamaica, Japan, Korea, Panama, Quebec (Canada), Romania, Scandinavia (Denmark, Norway, Sweden), Tanzania and The Netherlands. The TOPSHOP venue this season is the Tate Modern with seven shows from some of London’s hottest designers taking place Sunday 16th – Tuesday 18th February in the Turbine Hall. Though the shows require an invitation, there will be a limited number of spaces available to member of the public and fashion fans to watch each catwalk show as it takes place from the Mezzanine balcony on the first floor. The Shop will be again be open over LFW and over Vodafone London Fashion Weekend.It will once again be designed and curated by CLM’s Robert Storey and will feature contemporary designers including Prism, Dominic Jones, Zoe Jordan and Bella Freud. This season we will also be showcasing a special collaboration we have done with RSPB. The 14th Feb also marks the start of National Nestbox Week so we have got some of the UK’s big contemporary designers to customisea nest box. They will also be on display in the shop and visitors (it’s open to the public) will be able to bid on them via eBay. Participants include: Piers, Atkinson, Jasper Conran, Giles, Patrick Grant, Katherine Hamnett, Wayne Hemingway, Stephen Jones, Julien Macdonald, Zandra Rhodes, John Rocha, Vivienne Westwood.